Citation: Shen G, L Xu, Geng M, Xu M, Li F, Tan Y. Relationship between MRI characteristics and outcome after gamma knife radiosurgery for astrocytoma. Biomedical Research 2013; 24 (4): 479-485. The objective of the present study is to explore the relationship between MRI characteristics and outcome after gamma knife radiosurgery for astrocytoma. According to the characteristics of the definition and contrast enhancement of the lesions in the MRI examination, subjects were divided into three groups. The effectiveness was defined as astrocytoma shrinkage. The relationship between MRI characteristics and outcome after gamma knife radiosurgery were assessed. Twenty of 43 patients showed effectiveness. Thirteen of 18 showed effectiveness in type I group, 5 of 15 in type II group, and 2 of 10 in type III group. No significant difference was found among three type s in the age, gender, Karnofsky Performance Status (KPS), lesion location, mean maximal diameter of lesion, radiotherapy and chemotherapy. The WHO grade I/II glioma was more frequently found in the type I or II group than in type III group (P = 0.000, for both), but significant difference in the number of WHO I/II grade glioma was absent between type I group and type II group. The therapeutic effectiveness in the type I group was superior to that in type II and III groups (P< 0.05 for both), but there was no significant difference between type I group and type II group. The mean survival time was 15.8, 12.9 and 11.9 months in the type I, type II and type III groups, respectively, and marked difference was noted between type I group and type III group (P=0.025). Conclusion: Some MRI characteristics are related to outcomes after gamma knife radiosurgery for astrocytoma. In spite of advances in surgery, radiotherapy and chemotherapy in recent decades, the outcome of patients with gliomas has not improved markedly, and the mean survival time of these patients is not longer than 15 months [1, 2]. Since the first report of Pozza et al in 1989 , gamma knife radiosurgery has been applied in the treatment of gliomas, and the encouraging results have been achieved in controlling the growth of small, low-grade and recurrent gliomas [4, 5, 6, 7, 8]. However, there are still controversies on the indications, dosage of radiation, determination of therapeutic efficacy, and comparison with the radiotherapy and boost-radiosurgery [1, 4, 7, 9, 10]. These controversies are required to be resolved in future studies. It is worth paying attention to how to predict the therapeutic efficacy based on imaging findings, because not every patient is willing or suitable to undergo initial surgical procedure which can make pathological diagnosis due to the differences in the individual characteristics and location of lesions. In the present study, the relationship between MRI characteristics and outcome after gamma knife radiosurgery for astrocytoma was evaluated in 43 patients, in which MRI findings were divided into three groups according to the characteristics of the borderline and contrast enhancement. Between November 2003 and April 2009, 43 patients with astrocytoma were treated with gamma knife radiosurgery at the Gamma Knife Center, Daping Hospital & Reserch Institute of Surgery, Third Military Medical University, Chongqing, China. The clinical characteristics of these patients are listed in Table 1. There were 28 males and 15 females with a median age of 43.6 years (range: 17~68 years). Pathological diagnosis was obtained from craniotomy (35 cases) and stereotactic biopsy (8 cases) in all patients, including 33 WHO grade I/II (76.7%) patients and 10 grade III/IV (23.3%) patients. The median duration of symptoms was 28.6 days (range: 12~47 days). The patients were scored 60~100 points (median: 86.5 points) by Karnofsky Performance Status (KPS). The median maximal diameter of lesions (length + width + height/3) was 3.53 cm (range: 2.6~4.7 cm), with 7 lesions larger than 4.0 cm. Twenty-one patients (48.8%) underwent normative chemotherapy, and 7 patients (16.3%) with lesions larger than 4.0 cm received radiotherapy. Clinical and imaging information was collected from the medical records, radiologic examination, and relevant physicians. Patients with diabetes mellitus, hypertension and use of special drugs were excluded. All patients had been fully informed of the consequences before the treatment and voluntarily accepted the treatment. Table 1: Clinical characteristics of 43 patients with astrocytoma before treatment. MRI results could be obtained before treatment in all patients. According to the characteristics of the definition and contrast enhancement of the lesions, the patients were divided into three groups. In the type I group (n=18), the lesions were focal with a clear definition, and showed homogeneous low intensity in T1- weight images and high intensity in T2-weight images, but did not or slightly enhance after contrast administration (Figure 1-A). In the type II group (n=15), the lesions were diffuse with unclear definition, and showed homogeneous low intensity in T1- weight images and high intensity in T2-weight images, but did not or slightly enhance after contrast administration (Figure 2-A). In the type III group (n=10), the lesions were diffuse with unclear definition and showed heterogeneous intensity in T1- and T2-weight images with bleeding, necrosis or cystic change. An obvious homogeneous/ heterogeneous enhancement area embraced or mixed by an edema-like area was observed in the lesion after contrast administration (Figure 3-A). 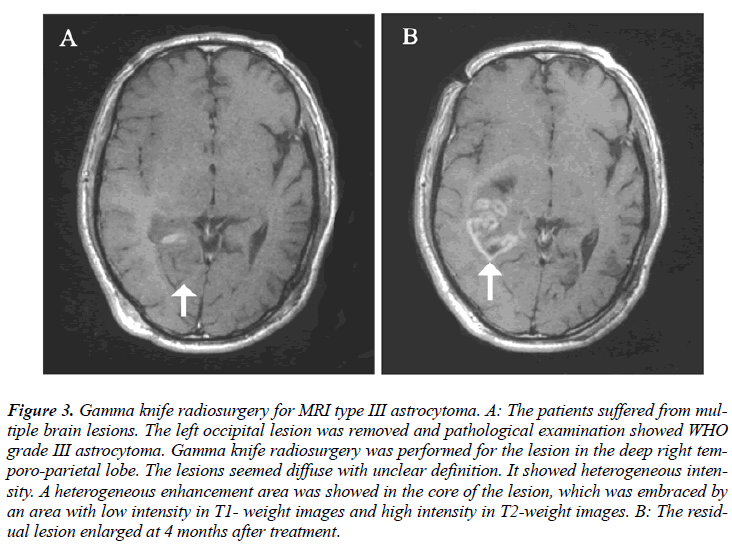 Figure 1: Gamma knife radiosurgery for MRI type I astrocytoma. A: The right frontal lesion was diagnosed as astrocytoma (WHO grade I) by stereotactic biopsy The lesion was focal with a clear definition. It showed homogeneous low intensity in T1-weight images and high intensity in T2-weight images, but enhancement was absent. B: The lesion shrunk and gyrus recovered in MRI with improvement of epilepsy half a year after gamma knife radiosurgery. 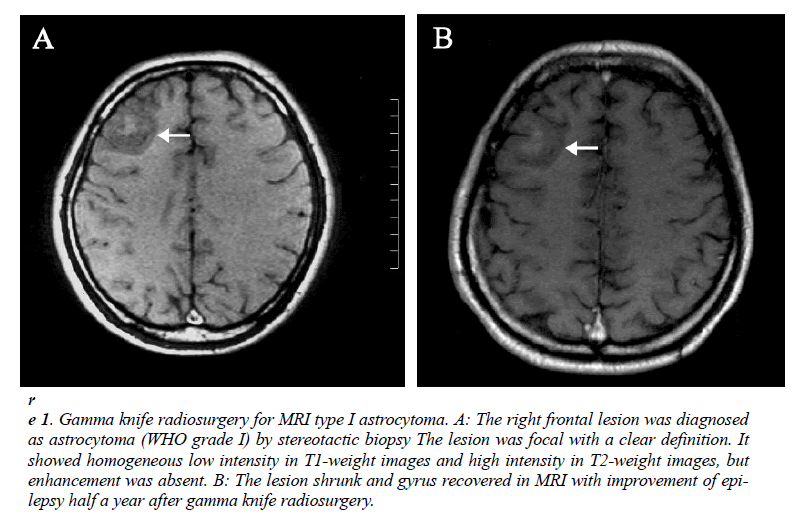 Figure 2: Gamma knife radiosurgery for MRI type II astrocytoma.. A: The residual astrocytoma (WHO grade II) was found in left frontal-temporal lobe following surgery. The residue lesion was diffuse with unclear definition. It showed homogeneous low intensity in T1- weight images and high intensity in T2-weight images, but enhancement was absent. Recurrence was observed in the posterior-inner area of the residual lesion at 18 months after treatment. Figure 3: Gamma knife radiosurgery for MRI type III astrocytoma. A: The patients suffered from multiple brain lesions. The left occipital lesion was removed and pathological examination showed WHO grade III astrocytoma. 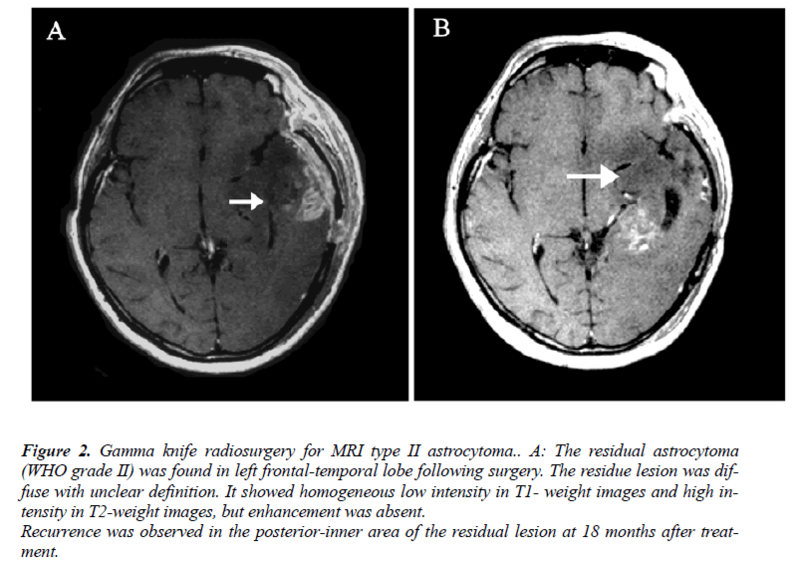 Gamma knife radiosurgery was performed for the lesion in the deep right temporo-parietal lobe. The lesions seemed diffuse with unclear definition. It showed heterogeneous intensity. A heterogeneous enhancement area was showed in the core of the lesion, which was embraced by an area with low intensity in T1- weight images and high intensity in T2-weight images. B: The residual lesion enlarged at 4 months after treatment. MRI slices with 3-mm thickness were obtained after Leksell Model G stereotactic frame placement under local anesthesia. The images were used with the Gamma Plan planning system software, and then treatment was performed using an OUR-XGD rotating gamma knife. The isocenter number used was 1-12. The target was covered by isodose curve ranging from 40% to 55%. The mean marginal dose used was 13.7 Gy, ranging from 8 Gy to 16 Gy. The complete follow-up was performed by clinic visit and MRI examination following gamma knife radiosurgery once every two months for 13.4 months (range: 4-26 months). The controlling efficacy of tumor growth was evaluated by RECIST criteria and classified as complete response (CR), partial response (PR), stable disease (SD), and progression disease (PD). CR and PR were considered as effectiveness in the present study. The common condition of tumor control in each MRI group was first determined with descriptive statistical method. The differences in age, gender, duration of symptoms, KPS, maximal median diameter of lesion, location of lesions, pathological grade, radiotherapy, chemotherapy, marginal dose and number of patients with effectiveness in different groups were analyzed with two-tailed Fisher’s exact test for ordinal data or two-tailed independent samples t-test for continuous numerical data. The lesions were divided into the shallow and deep ones according to the location. The shallow tumor involved in the cortical cerebrum, and deep tumor in the deep cerebrum, cerebellum and brain stem. The pathological grade included WHO grade I/II and grade III/IV. The survival time was analyzed with Kaplan-meier method. All the patients were followed up. Twenty patients (46.5%) showed effectiveness. Thirteen patients (72.2%) showed effectiveness in type I group, 5 (33.3%) in type II group, and 2 (20%) in type III group. The expansion of the lesion was observed in 8 patients, including one patient in type I group, 2 in type II group, and 5 in type III group, of whom 4 experienced craniotomy. Five patients died, including 2 in type II group and 3 in type III group. Four patients died of the development of the tumor and one of other disease. Chi square test or independent samples ttest showed no significant difference among three groups in the age, gender, KPS score, location of lesions, mean maximal diameter, radiotherapy, and chemotherapy. The number of patients with WHO grade I/II glioma was significantly higher in the type I or type II group than in the type III, but no significant difference was noted between type I group and type II group. More patients in the type I group achieved effectiveness than in the type II or type III group, but there was no marked difference between type II group and type III group (Fig 1B, 2B, 3B; Table 2). Kaplan-meier analysis showed that the mean survival time was 15.8, 12.9 and 11.9 months in the type I, type II and type III, respectively, and significant difference was observed between type I group and type III group (P= 0.025) (Fig. 4). Table 2: Univariate analysis of various MRI type. Glioma has become a common tumor in the central nervous system in recent years. To control the development of tumor and increase the survival time of patients with glioma has been a crucial goal in the treatment of glioma. The importance of radiotherapy in the treatment of malignant tumors has been well recognized. However, many types of glioma are resistant to radiotherapy and higher radiation dose is usually required. Conventional fractionated radiotherapy does not meet the requirement for high dose because of the limited tolerance of the normal brain tissues to the radiation. So, the methods for glioma radiated locally with high dose, are still longed for. Radiosurgery has been employed in the treatment of glioma due to its non-invasion and locally accurate high-dose radiation, but its efficacy and prognostic factors remains to be revealed. 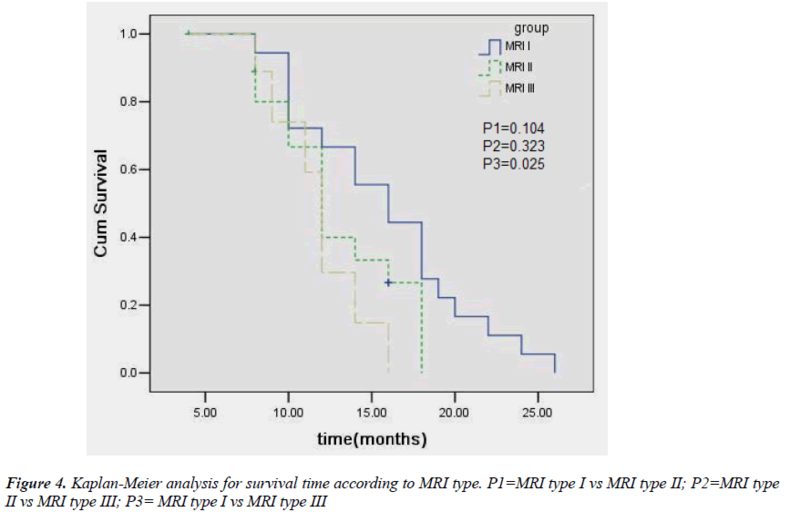 Taking it into account that some glioma patients preferred to radiosurgery as an initial treatment because of individual health status, lesion location and so on, the study on the relationship between the characteristics of MRI of glioma and radiosurgical efficacy was necessary. The manifestations of astrocytoma are complex and diverse on the MRI. In our study, therapeutic efficacy of gamma knife radiosurgery was different among different MRI types: the better control of tumor growth was achieved in type I group and type II group, accompanied by prolonged survival time. Our results suggested that some MRI characteristics could be related to the outcome of gamma knife radiosurgery for asgtrocytoma. Clinical observations found that MRI characteristics were different among astrocytoma patients with different pathological grades. The astrocytoma of low grade showed homogeneous low intensity in T1-weight images and high intensity in T2-weight images with or without clear definition, but did not or slightly enhance after contrast administration because of no or mild damage to the blood-brain barrier; the astrocytoma of high grade showed heterogeneous intensity with unclear definition. A homogeneous or heterogeneous enhancement area was observed after contrast administration because of severe damage to the bloodbrain barrier, which was embraced or mixed by an edemalike area . On the other hand, the pathological grade of astrocytoma was considered to as an important deter minant of the therapeutic efficacy among many prognostic factors. Grabb et al  studied the radiosurgical outcome in 13 patients with pilocytic or low-grade astrocytomas, and found that all the patients remained alive and 11 patients had tumor control (no evident tumor, n = 4; decreased tumor, n = 5; and unchanged tumor, n = 2) in a follow-up period ranging from 6 to 48 months. Somaza et al  reviewed the radiosurgical experience in 9 patients with growing and unresectable deep-seated pilocytic astrocytoma locating in the brain, thalamus, temporal lobe, hypothalamus and caudate nucleus, and found that the tumor size decreased markedly in 5 patients, and remained unchanged in 4 patients in a follow-up period ranging from 13 to 41 months. In contrast, Masciopinto et al  reported that the actual 12-month survival rate was 37% with the median survival time of 9.5 months in 31 patients with glioblastoma multiforme, which was not superior to that after traditional surgery and standard radiotherapy. It was presumed that the different outcome of gamma knife may be attributed to different pathological basis embodied in different MRI type group in the study. The type I and type II tumor represented low-grade one, while type III tumor represented high-grade one. It formed a support for the presumption that the patient number of WHO level I/II in type I and II group was significantly higher than those in type group III. In our study, the outcome in the type II group also representing low-grade tumor was inferior to that in the type I group. This can not be explained by the above presumption. It was well known that the tissues outside the target received only low dose radiation because of lying in the "fall-off" dose area for radiosurgery. The more invasive portion is situated in the "fall-off" dose area and can not be radiated effectively due to the difficulty on the image display for widely-invasive tumor. The poor outcome is also associated with their wide invasion in addition to the dynamic mechanism of cell proliferation for high-grade tumor. However, the invasion of astrocytoma does not always depend on the pathological grade, and low-grade astrocytomas often widely invade the normal brain tissues but have slow dynamic process. Thus, the radiosurgical efficacy of low-grade astrocytoma can not be generalized. In this group, the main difference in MRI characteristics between type II group and type I group is definition of the tumor, and the unclear definition in type II group represents a greater range of invasion. This may attribute to the poorer outcome in the type II group than in the type I group. In our study, MRI characteristics of astrocytoma were classified into three types according to the definition and contrast enhancement of the lesions, and results showed that the therapeutic efficacy of radiosurgery was related to the MRI types of astrocytoma, which may be attributed to that the MRI types reflect the pathological grades of astrocytoma. The results may supply an alterative for the judgment of outcome of astrocytoma patients after Gamma Knife, especially for patients without pathological diagnosis.